Bonnyrigg Rose manager Robbie Horn praised goalkeeper Bryan Young for his penalty-saving heroics to ensure they set up a South Region Challenge Cup Final meeting with East Kilbride next month. Young thwarted Stirling University duo Aiden Peden and Blair Lyons’ spot-kicks to seal a 4-2 shoot-out triumph and hand the New Dundas Park men a third scalp over Lowland League opposition this season. Having already knocked out BSC Glasgow and East Stirlingshire in previous rounds, Horn’s side found it a lot tougher against the full-time students in atrocious conditions. A goalless 90 minutes, in which the visitors carved out numerous chances but failed to take them, set up a tense period of extra-time. Neither side could break the deadlock after 120 minutes and it was left to Bonnyrigg shot-stopper Young to grab the headlines as his string of standout stops kept alive their hopes of securing a second trophy of the campaign. The East of Scotland Conference B champions will now face Lowland champions Kilby at Meggetland Sports Complex on May 26. “We had a few injury problems to contend with, so it was a fantastic result considering we played an extra 30 minutes when ten men,” stated Horn. “My players deserve a lot of credit because they really had to grind it out. I felt we were the team in the ascendancy in the second half and were unlucky to hit the woodwork twice late on. Bryan is a top goalkeeper and we’re very lucky to have two fantastic No.1s in him and Michael Andrews. They always push eachother and Bryan deserves to be the hero this time around. Former Whitehill Welfare goalkeeper Young denied he had done any research on Stirling’s recent spot-kick record, but admitted some midweek practice came in handy. He joked: “We don’t normally practice penalties, but we did after training on Thursday night. The boys will deny it, but I managed to save a few of them, so maybe that was a good omen! “There wasn’t any studying involved. I just guessed and dived the right way. It was pure instinct and luckily it worked out in the end. This was only the second competitive meeting between the sides in their history – the previous instalment ending 1-0 in Bonnyrigg’s favour during a Scottish Cup second-round tie in September 2012. The visitors shaded a largely uneventful first half with frontman Lyons, who signed a pre-contract agreement to join League One side Montrose last week, proving a constant menace to the hosts’ defence. However, Bonnyrigg slowly grew into the contest and Lewis Turner saw his driven effort from 25 yards crash back off the foot of the post with five minutes remaining. Keith Lough then clipped the crossbar before the home side were reduced to ten men after Dean Hoskins was shown a second yellow card for a late challenge on Lyons. Dean Brett converted the first penalty and Young denied Stirling’s Peden with a one-handed save. The next five spot-kicks were scored before Lyons’ tame effort from 12 yards was stopped by Young. 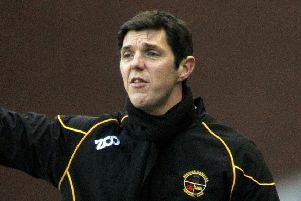 Deflated Stirling head coach Chris Geddes felt losing out on spot-kicks was harsh on his side. He admitted: “I’m gutted. I thought we were excellent against one of the best teams in non-league football. We forced them into a change of formation early on because they were finding it difficult to create opportunities, but we’ve not put the ball in the net, which has been the story of our season.